This novel is post-apocalyptic and dystopian. The people in the world Jonas inhabits live without choices. They are assigned roles; their mates and even if they will get married is decided for them. They are allowed two children, and even their children are assigned to them and named. Everything is regulated. If people are given choices, they might make the wrong choice. Jonas is selected to be the “Receiver”, he goes for special training with the old Receiver, who is now The Giver. He holds the memories of the people, this is what he now begins to give to Jonas. Once Jonas starts to receive these memories, he begins to learn the secrets of the community and question everything he has previously accepted. From the very beginning of this novel one can tell there is something sinister in Jonas’ world. Something evil hiding below the veneer of perfection and wonderful lives everyone lives. The fact that there is no fear, no crime, and ‘voices from the sky’, that know when you’ve done wrong proves it. After reading some of the book I guessed at one thing, and later turned out to be right, but the ending was somewhat of a surprise. It also ended with a not quite finished feeling to it, but hopefully the other books will help round out the story. The three companion books to The Giver are: Gathering Blue; Messenger; and Son. I have all three and will be writing reviews when I finish them. 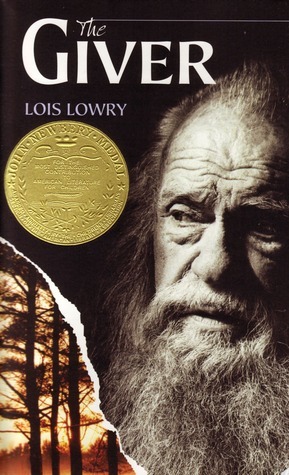 Posted by Belleza on October 20, 2014 in Children's book, Classic Literature, Fantasy, Fiction and tagged Dystopian, Library Book, Liked it ♥, Lois Lowry, Post-apocalyptic, Recommended to read, Series.